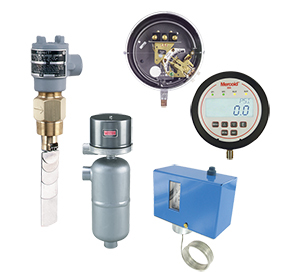 Dwyer Instruments offers many electrical switch products that make or break a contact based on sensing a parameter such as pressure, temperature, level, and so on. Most switches are single pole double throw, often referred to as SPDT. This type of switch has one normally open contact and one normally closed contact. Switches can also be double pole double throw, or DPDT, that have two normally open and two normally closed contacts. Single pole single throw switches with just one contact are also available and are specified to be either normally open or normally closed.